Just as parents are kind to their children, the Lord is kind to all who worship him. I am a fortunate person. My Dad was a very good role model for me. In light of Father’s Day, I have been reflecting upon what my Dad taught me. I grew up on a dairy farm. My parents, siblings and I provided most of the labor for our small dairy operation. My Dad taught me about hard work. I was a child who grew up believing that I could accomplish anything I wanted if I simply worked hard. My siblings and I have this work ethic ingrained into our beings. We do work hard. We put in the necessary time to make sure the things we have committed to are completed. My Dad was honest and told you how he saw things. He wasn’t one to beat around the bush but simply say how he viewed things or what he felt. I have this trait also. At times, I should be more careful in massaging something that I say. Then, I recall how sometimes this happened to my Dad. Me: What color do you think? Me: I need a haircut. This photo is from the early 1970’s. About 18 months ago, my Dad passed away. So many times, I have wanted to pick up the phone and call him. I try to think about what advice he would have given. Or what he would think of a particular situation. 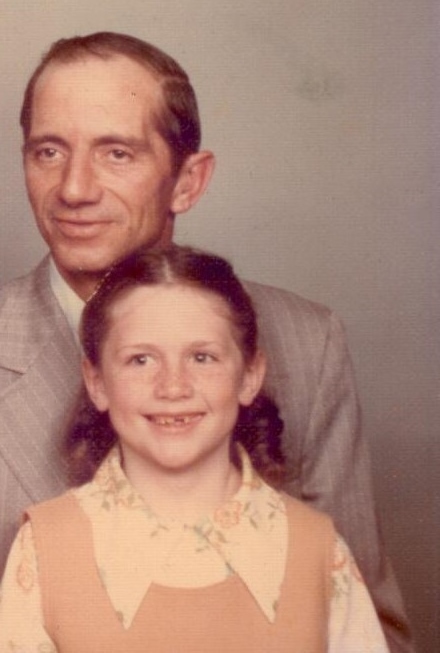 My Dad wasn’t perfect. But he gave me a wonderful foundation. I have two forever Dads: my birth Dad and my heavenly Father. For this, I am very fortunate. Lord God, thank you for the important male role models in our lives. May their hearts reflect your heart, O God. Inspire us to be great foundation people for those we love. Amen. Fresh paint, new carpet: what more can a girl ask for? Had to move some furniture to get in/out the door. No, give generously to needy persons. Don’t resent giving to them because it is this very thing that will lead to the Lord your God’s blessing you in all you do and work at. I’m in love. With my new carpet. We moved into our house nine years ago. The main hallway and the master bedroom had 1990’s maroon carpet. While it was once a nice carpet, it was covered with wear spots. 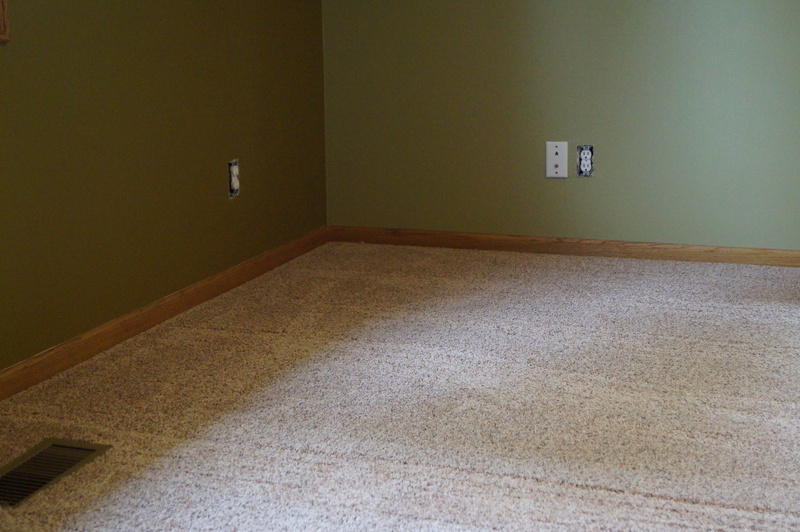 Every little piece of lint or light-colored particle glared off the dark carpet. While vacuuming I would think, “Soon, this will be the last time I’ll have to vacuum this carpet.” It is now true. Several years ago during a sermon, I spoke about how often when we get new things, their allure soon wears off. We often take “wants” and translate them into “needs.” I encouraged people to think about how long a new purchase REALLY makes them happy. 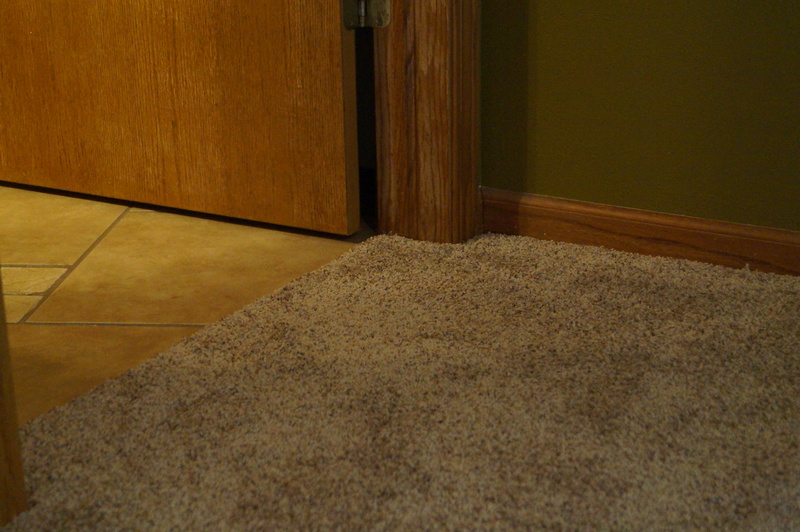 The next time I appealed to Rick about new carpet, he said something like this, “So how long do you really think new carpet will make you happy?” I hate it when this happens. This has been an ongoing struggle for me. I could take the money carpet would cost and put it towards a water well in Africa. I could make a nice donation to the “No Malaria” campaign. I could help fund the local food pantry for a month. Honestly, I’ve been coveting new carpet for nine years. Two years ago, a nice woman came, measured and gave me quotes. I had the money saved. Instead, I went with my friend Kristin to Argentina. 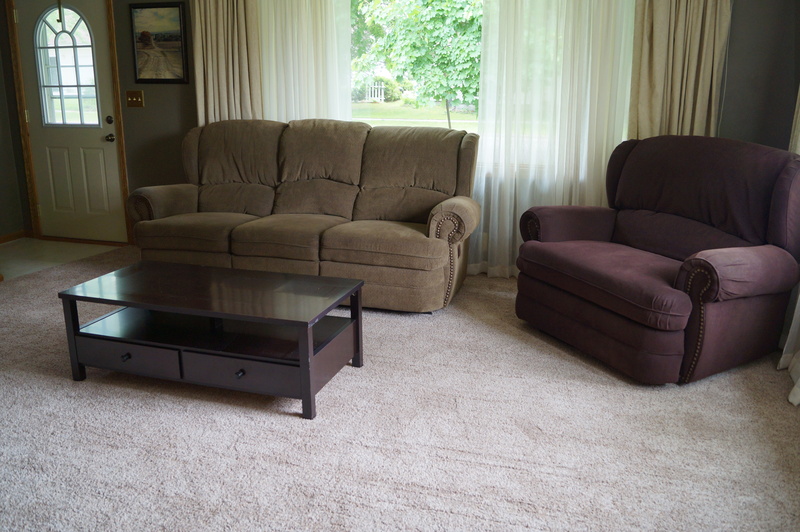 I saved the money again but felt I could not justify new carpet while unemployed last summer/fall. A few weeks ago, I stopped at the same carpet shop. I found an acceptable carpet on sale. The nice woman still had the measurements. I could get the high-end pad for the cost of the entry-level pad if I ordered quickly. I ordered carpet for the master bedroom and the living room. Today, as my feet squish across the soft new fibers, I’m in love. I almost don’t want to put the furniture back. But we need a bed to sleep on and to get to the vacuum cleaner. I’m not sure how long this new carpet will REALLY make me happy. Carpet isn’t more important than many other things in this world. I have decided to tithe the cost of the carpet to a special project. It is one tiny way I can turn my want into fulfilling a need for someone else. I believe God desires for us to be happy, to enjoy special things in life … and to be gracious givers in light of our blessings. I don’t expect God to bless me because I have new carpet. But I can take this experience and bless someone else in light of it. Thanks be to God. It is so humbling to see how I am blessed by you, Lord God. How all of my needs and so many of my wants are fulfilled. May I see that happiness comes more from you than from material things. Develop deep within me the desire to bless others who have so much less than I do. Amen. Jacob packed up everything he owned and left for Egypt. On the way he stopped near the town of Beersheba and offered sacrifices to the God his father Isaac had worshiped. Tonight, Rick and I drove into the garage after a week of vacation. Two thousand miles later, we are still talking to each other and have a bucketful of memories. Years ago, Rick took me to Mt. Rushmore, Yellowstone and the Tetons because I had never been out west. This time, we headed the opposite direction since Rick had never been east of Indiana. We left last Sunday right after the second worship service, with a hotel reservation in Canton, OH. Since “spontaneous” is one of Rick’s favorite words, I tried not to have too much planned. I planned some things but allowed flexibility to just let the days unfold. Sometimes, it IS best to let things happen. Allow to be surprised. Pack in flexibility. Be moved as the spirit leads. So we did. We saw Aaron Roger’s and Russell Wilson’s Superbowl uniforms at the Football Hall of Fame. A tour guide helped us relived the Gettysburg battle were we learned that Ulysses S. Grant’s middle name really didn’t begin with an S.
Approaching Washington D.C., I confirmed with some cousins that yes, we accepted their offer to bunk at their Maryland house. They live relatively close to the Metro which easily whisked us right downtown. 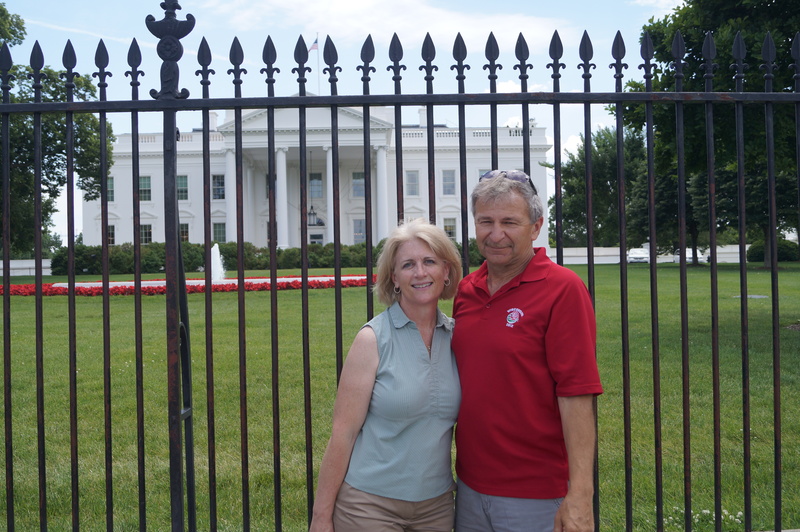 We walked miles as we hoofed it from major D.C. site to site in the warm sun. As the Monuments by Moonlight tour ended at the FDR memorial, we were cooled off by big rain drops running down our noses. One of our favorite meals was at the American Indian Museum. 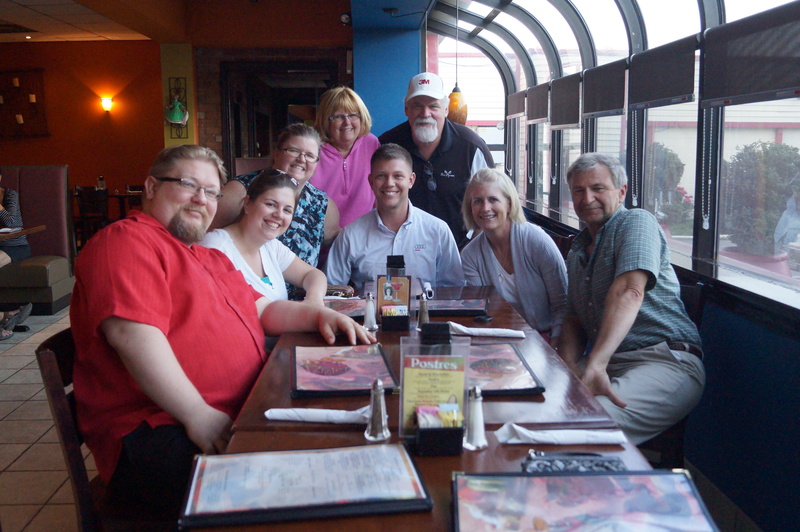 A highlight was having dinner with several Sowers cousins our last night in D.C. When Rick and I left the next day, we didn’t have a return trip plan. While drinking coffee and slurping Wendy’s Frostys, we chose the scenic West Virginia route. About 75 miles shorter, it also meant twisting through the Alleghany Mountains. An online review spoke of lots of rusted vehicles and Depression-era houses along the route. Very accurate. The author spoke of a particular section which he/she felt a Confederate soldier walking home could have stepped right out of the woods. After looking over thousands of Civil War gravestones in the Gettysburg and Arlington National Cemeteries, the irony was not lost. A seasoned traveler, I still over pack. This meant too many snacks, unworn clothes and books on CD to listen. My cousin’s wife spoke the irony that my truck-driving husband took a driving vacation. Yet Rick now feels he can give an accurate soybean and corn report for several states. He added several states to the “been there” list. We were again impressed by our country’s grandeur. How can the deep West Virginia gorges not be magnificently created by someone greater than us? We were also saddened by human kind’s sinful nature, which ultimately lead to 50,000 casualties during the three-day Gettysburg battle. We pack our lives with many, many things. This week, I’ll return to the unfinished items that sat for a week. I’ll prepare for worship next Sunday. We have a grand daughter’s birthday to celebrate, a doctor’s appointment for Rick’s Dad and a wedding next weekend. Once again, I’ll over pack another week. But I also plan to leave a little flexibility. God moments, leading of the Spirit, unplanned surprises. If we allow this, God will show up. Lord God – forgive us when we do through our days without consulting with you. Forgive us when we pack our days full of things that pull us away from you rather than to you. Help us accept flexibility and your spirit to guide us this day. Inspire us to worship you today. Amen.